The battery in your vehicle stores a corrosive concoction of chemicals which produce electricity for the engine and all those passenger smartphones. What happens when fluid inside the plastic container escapes? Most noticeably, a crusty corrosion forms around the battery terminals. That corrosion impedes your vehicle’s electrical system functions. 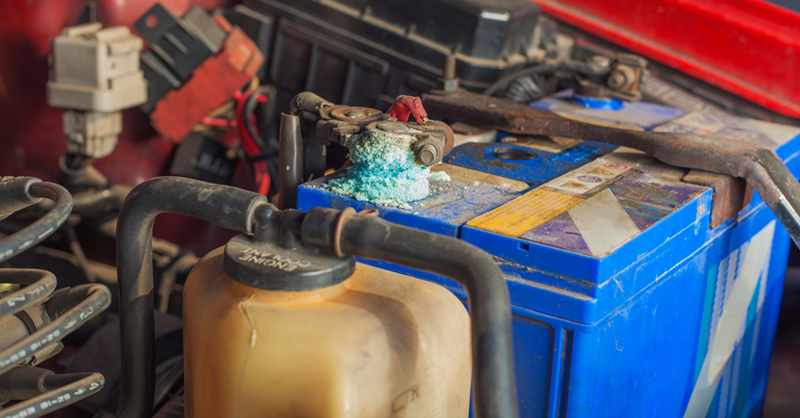 In severe cases, corrosion can destroy your battery entirely. Risk of corrosion is highest during the summer as temperatures cause batteries to overheat quickly. Corrosion occurs when hydrogen gas emanating from battery acid mixes with the already sweltering atmosphere under the hood. If the corrosion is around the positive terminal, your system is overcharging. Corrosion on the negative terminal means the system is undercharging. Cables should have no fraying and must be secured firmly to the battery. Also look for cable corrosion, which reduces power from flowing from the battery. Inspect the battery for leaks, cracks or bulging. Any one of these symptoms means it’s new battery time. A cracked, leaking or swollen battery poses serious safety hazards for you and your vehicle.